I saw the movie, 2001: A Space Odyssey, in 1968 when I was 12 years old. It was as incomprehensible to me as a child, as it was to most adults then. Even so, it was soon considered a classic science fiction film and I have spent most of life not really understanding why. I had heard that the book was much better, but I never got around to reading it until recently. It is, indeed, much better and I think there are several reasons why. For one thing, the novel was written by Arthur C. Clarke, one of the best SF writers ever. But even so, this novel was written under special circumstances because the story was meant to be a movie from the start--a collaboration between Mr. Clarke and film producer Stanley Kubrick. That collaboration is described by Mr. Clarke in his Foreword to the edition of the novel that I read. He says Mr. Kubrick suggested they start with a novel from which they would derive the screenplay because "...a screenplay has to specify everything in excruciating detail, [and] it is almost as tedious to read as to write." This is more or less the way it worked out, though toward the end novel and screenplay were being written simultaneously, with feedback in both directions. That dynamic shows in the book. Though the narrative is engaging, owing to Mr. Clarke's skills, there are sections that seem to be explanatory for the sake of the film. Some of these take the point-of-view of the aliens in general--not of a particular alien character (e.g., chapter 37: "Experiment"). At one point, the narrative even takes the POV of the big monolith Bowman finds on Japetus. And then there are sections that are descriptions of various views in space of suns and moons and planets. They are well-done and intellectually informed, but with only a scant connection to the plot or a character. All these sections seem to be for informing the film producers and for the sake of writing the screenplay. They are informative for the novel reader because they fill in the holes left by the film's ambiguous images, but they lessen the novel's storytelling. They don't lessen it by much, though, mostly because Mr. Clarke was the author. So the book answers the questions raised by the movie. For instance, it makes clear that the monoliths were tools used by ancient and god-like aliens to influence the evolution of other life-forms. Used on our non-human ancestors of three million years past, it exerted only a small nudge to launch them on the path to the tool-making that promoted the explosion of their intelligence. Understanding that, makes sense of the film's initial scenes of the ape-men and that image of the tossed bone morphing into the space shuttle. We also better understand why the mission to Jupiter (actually, Saturn in the book) was undertaken. I don't recall whether the movie made it clear that the monolith found on Earth's moon sent a high-powered electromagnetic signal to Jupiter (in the book, it went to Saturn's moon, Japetus) and so prompted the human journey there. It is clear in the book. And the book does contain the sudden shift in narrative from the monolith's signal blasting out into space, to the spaceship, Discovery, as it passes through the asteroid belt. In the book as in the movie, this struck me as too sudden a shift, leaving out a needed bridge. It drops, too suddenly, the POV of Heywood Floyd, whom we had been following since the three million year scene-shift from the group of ape-men. It just doesn't feel right. ...it was as clear and unmistakable as a vapor trail across a cloudless sky, or a single line of footprints over a field of virgin snow. Some immaterial pattern of energy, throwing off a spray of radiation like the wake of a racing speedboat, had leaped from the face of the Moon, and was heading out toward the stars. The part about the "mutiny" of the HAL 9000 computer in the book is pretty much in sync with what was presented in the movie. The book didn't contain the "lip reading" scene, though, which I thought was a nice touch by Mr. Kubrick. And then HAL's murder of the hibernating crew and attempted murder of Bowman are handled a bit differently, but retains Bowman's surviving for a few minutes in a vacuum without his helmet, and his "lobotomy" of HAL. The last part of the story, though, is where the book is way easier to follow than the film. This concerns Bowman's investigation of the big monolith he found on the Saturn moon of Japetus and his subsequent capture by it, transport across the galaxy (the monolith is a "star gate"), and finally his transformation into the "Star-Child." The book makes all this clearer mostly because we have Bowman's inner monologue about what's happening to him, supported by Mr. Clarke's prose exposition. This part contains a lot of those sections where I think Mr. Clarke was explaining things for the sake of the producers, but it still captures the extreme bizarreness of Bowman's evolution/transformation. The reader understands that it is being deliberately done by the aliens. In the movie, that's far less clear. The book notes that Bowman is quickly aware that the "hotel room" he lands in is an artificial construct. He finds proof by examining the objects in the room and from watching the television mounted in the ceiling over the bed. I think the movie would have worked better here for the audience if Mr. Kubrick had incorporated those points. Finally, because the reader knows that Bowman has been transformed via some speeded-up process of evolution into the Star-Child, the final scene is much less enigmatic. We know that the Star-Child is David Bowman. He has been empowered by being freed from his corporeal body to become a being of energy and taking the form of the Star-Child. He begins to exercise his new power and freedoms and finds he can move across the galaxy at the speed of thought, and so returns to Earth. All this is depicted in the movie, but not explained. I don't know how many viewers were astute enough to follow that thread. Now Mr. Kubrick decided to leave his viewers with an artistic image of the Star-Child contemplating Earth. Most viewers were just left in confusion. Mr. Clarke's novel presents a less mysterious ending by keeping the POV with Bowman as the Star-Child and having him save the earth from destruction, making an anti-Cold War statement in the process. And he does this in a final chapter that is less than a page in length. I think it's a much more satisfying an ending. When he tired of official reports and memoranda and minutes, he would plug his foolscap-size Newspad into the ship’s information circuit and scan the latest reports from Earth. When Earth was tamed and tranquil, and perhaps a little tired, there would still be scope for those who loved freedom, for the tough pioneers, the restless adventurers. But their tools would not be ax and gun and canoe and wagon; they would be nuclear power plant and plasma drive and hydroponic farm. The time was fast approaching when Earth, like all mothers, must say farewell to her children. This was the belief and the hope that is all but squashed now by a space agency that is absorbed by a military pushing for constant war rather than space exploration. And it is apparent that Earth will be more than just tamed, she'll be pillaged and raped. And if any humans make it beyond Earth orbit now, they'll likely be soldiers bent on conquest and exploitation, rather than "tough pioneers" or "restless adventurers." It is conceivable that the state of real-world technology in 2001 could have approximated what Mr. Clarke and Mr. Kubrick foresaw in their story, but the urge to make profits and subdue and rule the earth took precedence over space exploration. Consequently, there appears little hope for real space odysseys anytime soon. Even if an alien artifact such as the monolith were found, I suspect our rulers' would only be concerned with how to exploit it for profit, or how to militarize it. Still, I understand now why 2001: A Space Odyssey is considered a classic movie, though I think it takes reading the associated novel to reach that understanding. 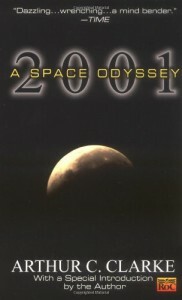 The novel is a reminder for me of the heady days of the "space age" and the "moon race." I had all but forgotten them in these darker times. It may be that pointing out the gap between human dreams of a bold future, and the reality imposed by rulers motivated only by greed and personal power, is the greatest value of this novel. Sometimes truth-in-fiction comes indirectly.